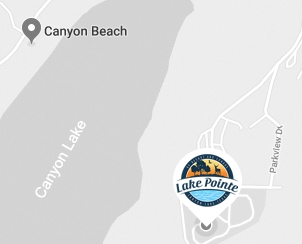 Conveniently located with direct Canyon Lake access for swimming, fishing, canoeing and kayaking, Lake Pointe Condominiums consists of 10 units. Six condominiums are 2 bedroom/2 baths , and four condominiums are 3 bedroom/2 baths. 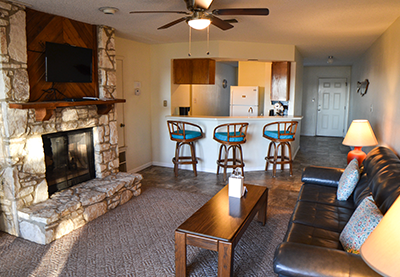 All units are furnished, fully equipped and complete with a fireplace and a lake view. You will find our kitchens are well equipped for your convenience. All units have flat screen LED televisions with satellite TV channels. 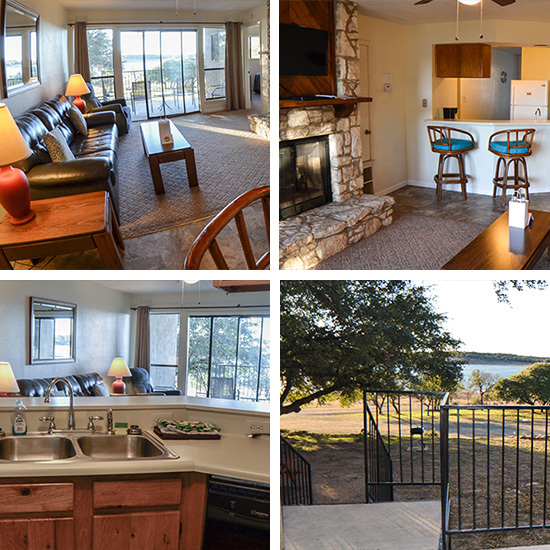 Condominium reservations are open to everyone and are accepted daily by phone, 830.935.4351. Contact our office regarding deposits. CHECK-IN time is at 3:00 p.m. Earlier check-ins are subject to availability, contact the office for details. Late arrivals are welcome; however, you must call ahead to make arrangements. CHECK-OUT time is 11:00 a.m. The parking lot in front of the condominiums will not accommodate boats, trailers, or oversize vehicles. A free designated boat parking area is available in the nearby gated section of the resort for your convenience. All vehicles must display car tags while on the resort property. There are no refunds for canceled reservations, however, you may reschedule your stay by calling the office at 830.935.4351 Pets are allowed with a non-refundable pet fee. The public can make reservations up to 6 months in advance.